Now that the new year is here, it’s time to get off to a good start! Many resolutions usually include getting organized, making healthy choices, and saving a few bucks. One area which can help you greatly with all of those resolutions is getting your grocery routine in order. That’s right. Grocery shopping is probably at the heart of a lot of your stress. Think about it. Without a plan you feel frazzled when you have no food in the house, but don’t have a clue what to buy because you have no idea what meals you’ll be making for the week. When you get to the store, you worry that you are paying too much of your hard-earned money at the register, but just can’t seem to find the time to look for the best deal or figure out all those coupons and apps. So you end up just grabbing quick dinners, probably frozen or processed and full of preservatives and chemicals, which leaves you feeling guilty that you aren’t providing the healthiest food for your family. You just can’t seem to win the grocery game! I know the feeling because I was there too. Wouldn’t it be nice if you felt in total control of the money you hand over at the grocery store every week? Or if you felt confident that you were stretching your grocery dollars as far as they can go? And you felt free from the sick feeling you get when you know you’re wasting money? Even better, wouldn’t it be great if you knew you were serving your family delicious, health-conscious meals? Meals that you didn’t have to spend tons of time preparing, researching and shopping for…and that you had an entire system where all of this was not only possible, but your new normal? Over the years I have come up with a grocery strategy that works for our family. My advice is to start simple, first plan your meals and shop for them from your store’s weekly sales flyer. That’s the quickest and easiest way to start paying less for your groceries. Next, learn how to effectively use coupons. This does not need to be extreme couponing! To get started just choose one source for coupons – you can choose from newspaper inserts, coupons printed online, store coupons, or coupons from an app. Remember, pick just one source until your routine becomes a habit. Then you’ll be able to add additional coupon sources and possibly cut your spending even more without feeling overwhelmed. I’m happy to say there is an easier alternative than figuring everything out for yourself. 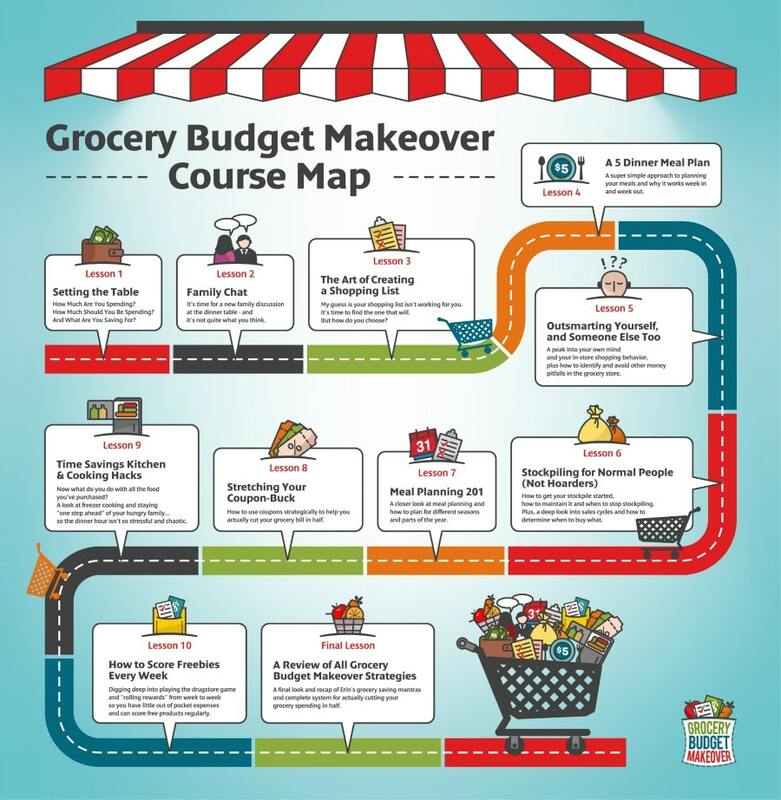 If you are looking for a way to quickly cut grocery spending in half, you’re going to LOVE the Grocery Budget Makeover! For less than the cost of one weekly trip to the store, The Grocery Budget Makeover is a total spending overhaul that will help you stop overspending, stop wasting money, and forever change your mindset and strategy when it comes to grocery shopping for all your family’s meals. There’s even a payment plan available to help the cost of the course fit within your monthly budget. Sorry you missed it! 🙁 Registration for the online video course is currently closed, but you can join the waitlist to be notified when the next class starts here. Think about how relieved you would feel if next week you knew what healthy meals you were making, and already had your ingredients at a price that didn’t bust your budget. At least one area of your life would be organized, healthy, and under budget. I am not a professional organizer, life coach, or self-help expert. I am a mom, wife, and small business owner with way too many things to do and not nearly enough time to do them…which leaves me frazzled all the time and with little time to do what I actually WANT to do. Well that is going to end. Everyone makes New Year’s resolutions and this year mine isn’t going to be a simple task. I don’t want to change one thing, I want to change many to give me the one thing I want back the most – MY life! If your life has somehow become so busy and complicated that you no longer recognize it, or if you just have to figure out a way to get what needs to be accomplished done in order to spend more time with your loved ones, then I hope you’ll join me on this adventure. We’ll be talking goals, schedules, organizing, budgeting, saving, and anything else we need to get ourselves back on track! Book mark >> this page << to see all the posts from this series and take back your life!